Registration has not started yet. Please come back in a few days for more details. the upcoming event of 2017 is dedicated to Campania, one of the Italian regions richest in history and traditions. The volcanic origin of the territory has made this land, which the Romans called "Campania Felix" (Campania fertile), one of the most suitable for growing grain and vegetables, as well as a cradle for a thousand-year-old gastronomic tradition. The first pizza has been prepared in Naples between 1796 and 1810, but the concept of this world-famous food can be found among the verses of the Aeneid, a Latin epic poem written by Virgil in the late 1st century BC. The preparation of the gastronomic specialties will be entrusted to Fabio and Stefania, both from Campania. They have been committed for a long time to developing a conscious fruition of the so-called Mediterranean cuisine and their Neapolitan street-food restaurant in Berlin - www.jammeja.de - has conquered a privileged place in the heart of traditional-food lovers. 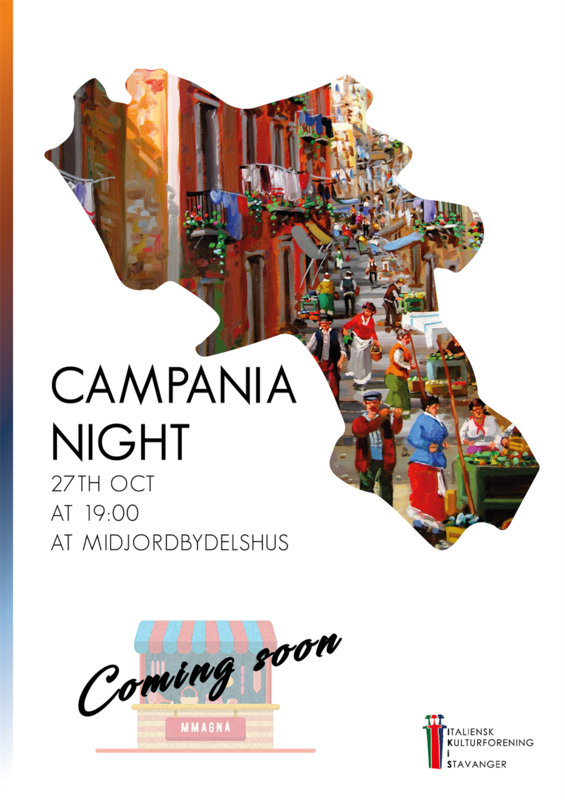 So let's meet at Midjørd Bydelshus to discover the traditions, the music and some street food specialities from this complex and amazing Italian region. Gluten-free option will be available. It is possible to pay the registration fee (in advance at registration) via Vipps, PayPal and bank transfer.